Sitges is a nice beach village on the coast 30Km south of the city of Barcelona, capital of the autonomous region of Catalonia. There are direct flights connecting Barcelona international airport (located 10Km south of Barcelona and 28Km north of Sitges) with most European capitals, as well as Tokyo, New York and other main cities. Further information about Barcelona (Location, territory and climate, Communication and transports, History, Economic data, Education and research, Sports, Culture, Environment, Public holidays, Barcelona in numbers, The map of Barcelona, Images of Barcelona, etc.). From the airport take the airport train which take you to "El Prat de Llobregat" Station in 5 minutes and there change to Sitges. The time interval between trains is about 30 minutes and they take you to Sitges (trains leaving direction "Tarragona" or "Vilanova i La Geltru") in about 25 minutes. A taxi from the Airport to Sitges could cost about 50 Euros. You will arrive at the Railway Station "FRANÇA". From there, you should go to the Central Railway Station "SANTS", either by metro or taking a taxi. Once there, take a train to Sitges (trains leaving direction "Tarragona" or "Vilanova i La Geltru"). 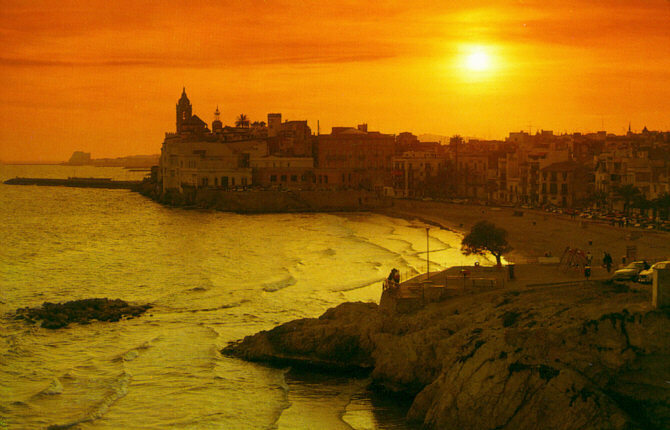 Trains leave about every 15 minutes and take you to Sitges in about 30 minutes from "SANTS" Station.